Join the world's most beloved cartoon characters in this new collection of wild and wacky classic animated adventures. It's all downhill when Goofy's car separates from the trailer carrying Mickey and Donald in the edge-of-your-seat hilarious thriller, "Mickey's Trailer." Then, the nephews are in for quite a lot of laughs as Uncle Donald tries to teach them how to chop wood, set up a tent, and avoid scuffles with hungry bears in "Good Scouts." The whole family will love every minute of these 8 laughter-packed escapades! 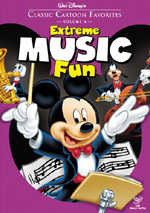 This hour of extreme fun includes: "Mickey’s Trailer"; "No Sail"; "Good Scouts"; "Hello Aloha"; "Old Sequoia"; "How To Ride A Horse"; "Trailer Horn"; and, "Two Weeks Vacation." With the wonderful “Walt Disney Treasures” sets meant for the serious collectors, we now get another series aimed more at casual fans of animation. Earlier we found four packages of character-specific shorts, but now we find some oriented toward themes. Entitled Extreme Adventure Fun, this one presents eight cartoons in one package that deal with wacky outdoors fun. Those die-hard fans will already own most of these shorts via a combination of sets. 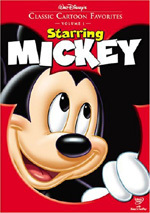 “Mickey’s Trailer” comes from Mickey Mouse in Living Color, Volume 1, while “Good Scouts” is on The Chronological Donald, Volume 1. Both “Hello Aloha” and “Two Weeks Vacation” can be found on The Complete Goofy. “How to Ride a Horse” first popped up on Behind the Scenes at Walt Disney Studios. This makes “No Sail”, “Trailer Horn” and “Old Sequoia” currently exclusive to this package, though I have little doubt they’ll eventually show up on a future Donald Duck “Treasure”. Mickey’s Trailer (1938, B. Sharpsteen): Mickey, Donald and Goofy take their mobile home on a trip. Not a lot of laughs result, but the short presents a high level of creativity and turns into something fun, mostly due to the nutty technology found in the trailer itself. 7/10. No Sail (1945, Jack Hannah): Donald and Goofy take a boat out to sea. When they run into problems with the sail, they get stranded in the middle of the ocean. It’s odd to see Donald and Goofy without Mickey, but the dynamic works. It’s even odder to see Donald with stubble coming out of his beak, and that doesn’t work, as it’s creepy. Overall, the short is clever and interesting enough to be good entertainment. 8/10. Hello Aloha (1951, Jack Kinney): Stressed by work, Goofy (aka George Geef) fantasizes about an island vacation. Never my favorite Disney character, Goofy becomes even less entertaining as the suburban “Geef”. This is a fairly dull short. 3/10. How to Ride a Horse (1941, J. Kinney): We learn about the equestrian arts and watch as Goofy demonstrates how to ride one - or at least attempts to do so. I’m not a fan of the “How to…” series, and “Horse” doesn’t seem very compelling. It’s very similar to about a million other Goofy cartoons, and it does little for me. 4/10. Trailer Horn (1949, Jack Hannah): Chip an’ Dale discover mysterious footprints and track them to a mobile home operated by Donald Duck. As usual, they irritate him. The chipmunks always provided good foils for Donald, and that proves true here. Nothing genuinely inspired occurs, but the scenario offers enough humor to work well. 6/10. Two Weeks Vacation (1952, Jack Kinney): Goofy gets times off from work and tries to get some R&R. Unfortunately, various obstacles block his path. “Vacation” plays a lot like a “How to…” short with the narrator and whatnot. It’s better than most of them, however, though the Goofy character is an odd one. He’s not quite the full suburban Geef, but he’s also not the lovable moron of old. 5/10. Voice actor footnote: the narrator and other non-Goofy lines are provided by Alan Reed. He’s best-known as the voice of Fred Flintstone. 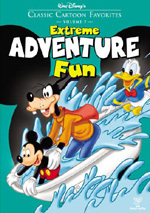 Extreme Adventure Fun appears in an aspect ratio of 1.33:1 on this single-sided, single-layered DVD; due to those dimensions, the image has not been enhanced for 16X9 televisions. Most Disney collections offer fairly consistent visuals, but this one jumped around more than a little. The biggest exceptions tended to come from the cartoons that didn’t appear elsewhere. “No Sail” and “Old Sequoia” tended to display more source flaws than the other shorts, and they lacked the same vivacity and depth. In addition, they seemed a bit too blown-out and bright. “Trailer Horn” bucked this trend, however, and appeared more in-line with the restored cartoons found in the “Treasures” sets. On the other hand, “How to Ride a Horse” was surprisingly ugly given that it came from a “Treasures” release. However, it reflected the transfer found on that DVD and didn’t look any worse here than it did there. The other Goofy shorts - “Aloha” and “Vacation” - were highlights, as they presented the DVD’s strongest visuals. Ultimately, this mix of highs and lows left Adventure with a “B-“ for its picture quality. Also erratic, the monaural soundtrack of Extreme Adventure Fun was fairly average. Dialogue sounded a little edgy at times, but for the most part, the lines were acceptably clear and accurate. Effects showed a bit of distortion and harshness, but they stayed fairly clean and distinct through the shorts. Music also demonstrated variable levels of shrill and rough tones, but this wasn’t unexpected, and the score seemed reasonably solid. Decent depth accompanied some effects, such as stomping of large characters, but the track was pretty thin and tinny as a whole. Varying levels of background concerns appeared throughout the shorts. I heard modest hiss at times during the cartoons. However, the tracks seemed pretty clean for audio of this era. “No Sail” was the biggest offender. It sounded consistently rough and brittle with lots of hiss. “Trailer Horn” also suffered from a muted quality. Otherwise, the audio was perfectly acceptable for shorts made 50-plus years ago. No significant extras appear on Extreme Adventure Fun. We get a collection of ads in the Sneak Peeks domain. This includes promos for Tarzan II, Cinderella, Lilo & Stitch 2, Kronk’s New Groove, Disney Learning Adventures, Pocahontas and the Disney Princess line of products. 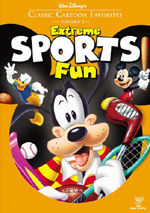 Casual cartoon fans will find sporadic entertainment in Extreme Adventure Fun. The eight shorts vary from quite good (“No Sail” and “Good Scouts”) to not-so-hot (“How to Ride a Horse”, “Hello, Aloha”). Of course, one’s fondness of various characters will affect your enjoyment; my pro-Donald and anti-Goofy bias comes out in my ratings. Still, there’s a reasonable amount of good material here, and the shorts come with perfectly adequate picture and audio for the most part. Die-hard Disney fans should skip this package. They’ll probably already own most of the shorts, and they’ll likely have the chance to get the others before long. However, if you don’t possess those other collections and just want a smattering of shorts, Adventure might work for you.